Google tests a new feature that makes Gmail chat more useful: users are able to make and receive Google Voice calls from Gmail. A new phone icon opens a Gmail chat window with a dialpad, an option to find contacts, a credit balance and a call button. Right now, if you want to call someone using Google Voice, you need a phone. You can either visit Google Phone's site on your computer, enter the phone number you want to call and wait until Google calls your phone and connects you for free or use Google Phone app on a mobile phone. The new feature will allow users to make voice calls over the Internet and it's likely that it won't be limited to Gmail. In April, TechCrunch reported that Google "built a Google Voice desktop application to make and receive calls" and that the application is tested internally. Google used technology from Gizmo5, a VoIP service acquired by Google last year. For now, Google Voice's integration with Gmail is not publicly available. YES!!!!!!!!!!!!!!! This is what I have been waiting for!!!!!!!!!!!!!!!! This made my day!!!!!!!!!!!!!!!!!!!!! Great, but where's my number portability, so I can have GV take over my mobile number? I wish I were in on all the beta builds, nay all the dev builds! Oh, how I hope the next step is SIP compatibility so I can use an ATA at home and tie in to the DMARC and make use of regular house phone jacks. @aegibson agreed; and I fully expect that the GV desktop client will be part of a new GTalk desktop client. Follow that up with number portability and real SIP compatibility and you've got a real disruptive technology for the telecom industry. Android App? Anybody? I wonder what the quality will be like. pretty please can we also get a fix to SMS notifications of a voicemail so they appear to come from the caller NOT from me? "Google said that GIPS technology allows users to significantly minimise the level of audio and video disturbances like jitter, echo and delays developers face when they create real-time audio and video streaming applications." Hopefully this comes really soon. Would love to have this. Maybe creating some kind of open video tech as well for video chat across all devices? And where is MMS support? when the hell is gvoice coming to canada? There is also the Chrome extension that allows you to make calls from your browser by typing the name or number of a contact into the extension's pop-up window or by clicking a phone number on a web page. Nice!! What about having TXTs that goto our gVoice account fwd to gTalk as an IM. Zach, that would be an interesting feature, but what would be the real value of that. If on a mobile device, you could text just as easily. If on a computer, the Google Voice extension for Chrome is pretty handy. More often than not, I end up using it almost like IM. i tried out today installing the plugin but i dont see anywhere the phone icon. Will it be available in Canada? I've been waiting forever for Google Voice. Google, here the loud cry from the great North! Canadians cannot wait to give Google Voice a try. Send Free SMS messages to UK mobile phones, any network, no signup, login or payment required. Any news on the addition of countries supporting Google Voice?? Alas that GV is not available in the UK. I'm really looking forward for Google Voice to become true VoIP! 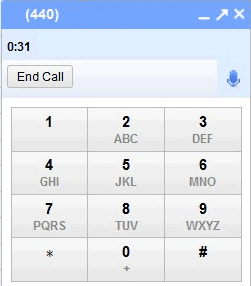 By the way, you don't have to use a phone to make calls using Google Voice. Nokia N810 and similar devices can be used also. You can also configure the desktop Gizmo5 to do that. Anyone think its just another way to get more/contact, advertising information? Can someone plz send an invite to littlejohnny1093@gmail.com . I still havn't recieved the one I requested 2 months ago. Sip Call goes beyond this however, also implementing a number of advanced features. Despite its' convenient interface that mirrors that of a typical telephone call, SIP is based on an internet protocol rather than that of the telephone industry. I had a GrandCentral account and watched it turn into Google Voice. Do I now get to watch my Gizmo account turn into Google VOIP? Suggestion for Google Voice: Dialing from your phone using the assigned google number: After a user of google voice uploads his/her contacts into GV, you should create a "dial-by-name" directory to access their contacts. We can call from our google number by calling it, then dialing in the number we want to call. You should also integrate the directory so we can use our contacts remotely. Make sense? I hope google come up with a true Skype alternative. We don't have competition in VoIP arena as of now and only Google can change the scenario. Can't wait to see GV working in our country, or thru SIP! Was just playing around but was able to receive and answer calls to my Google Voice number via the GoogleTalk gadget in iGoogle today. Was never able to try out the GoogleTalk forwarding in Gizmo5 before since I am on Mac and there is no GoogleTalk client available for it. I did set Gizmo5 up as the forwarding phone, which in turn forwards to "GoogleTalk" using my Google account details. I have installed the Google Talk gadget on iGoogle. Anybody else find the same? Try to call forward like : GV --> IPkall 425 --> LP voip ( http://bit.ly/bnQXij ) number --> Call Fwd to any international mobile number (low call rate). so how much longer is this going to take? any educated guesses out there? Works great for me, the Call Phone feature from within Gmail. Feature showed up in my gmail today. Works so far with North American numbers. My Call Phone feature in Gmail showed up today. Works great and free in North America till 2011. Google voip sooooo much better than Time Warner telephone and its over a TW ip connection! Crystal clear conversations. This feature is very powerful in my opinion. They should implemented it also for non US based countries. Also i think that if they do the above then they ' ll slap skype company in the face. Now time is changed Google changed the way of communication! You can find interesting most useful tricks on my blog. Miss Call Alert in India-Elaboration IT services is one of the best Voice SMS Provider Company in Jaipur India . It not only serves Voice SMS service in Jaipur India but also Voice SMS service in Achnera ,Chennai , Jaipur , Mp and all other places in India . We are not only Voice sms service provider but also miss call alert service provider in very low rate in India. Get notification about the missed call through an instant SMS Service. What's Still Missing in Google Chrome?